Aluminium Round Tubes are a very versatile product that has many attributes and many uses. Sometimes described as Aluminium hollow bars, Aluminium Tubes that we supply are extruded from top quality aluminium. The extrusion process produces Aluminium Tubes that are totally seamless inside and out. The outside surface is generally a shiny one making it relatively pleasing to the eye. As well as having good corrosion resistance, Aluminium Tubing is also suitable for anodising, powder coating and polishing. We stock Aluminium Round Tubing in 2 grades – 6063T6 & 6082T6. For many applications the grade of the tube will not be important, but for others the grade will be critical. Tubes that are supplied in Grade 6063T6 are suitable for bending, forming and swaging. Aluminium Tubes supplied in Grade 6082T6 are harder and therefore are excellent for drilling, threading and machining. 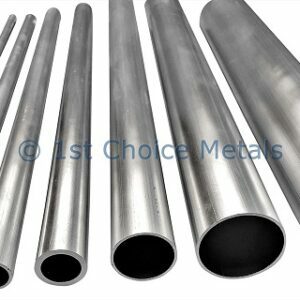 Both grades of Aluminium Round Tube are excellent for welding. If the grade of the Aluminium Tube is important to your application, then please contact us to discuss current grade availability. Although the bore size of the Aluminium Tube is often the dimension that is most critical to the user, unfortunately the tubes are not manufactured based on this internal dimension. Aluminium Tubing is manufactured and ordered to a specific outside dimension and wall thickness (usually 18swg, 16swg or 10swg) – frustratingly the internal bore size is rarely quoted by either manufacturers or suppliers. Below is a table showing the outside, inside and wall thickness dimensions of each Aluminium Tube that well sell via this website. Please be aware that extruded aluminium tubes are not precision tubes and are subject to the relevant European +/- manufacturing tolerances for both the outside dimension and the wall thickness. Variations in either, or both dimensions will of course influence the actual bore size of the tube. For further information regarding manufacturing tolerances for any of our tubes, please contact us. We are often asked if any of our Aluminium Tubes are telescopic – i.e tubes whereby one will fit inside, or over the other with very little play. Below are the sizes of Aluminium Tube that will slide together nicely. Of course, there are other sizes that will fit inside each other, but often with a good couple of millimetres ‘play’, and therefore we wouldn’t describe them as telescopic. Please refer to the above sizing chart for details of larger tubes that will slide together. Due to its versatility, Aluminium Round Tubes are used in many applications. They are perfect for use as poles and you will often see aluminium poles used on sign posts and road signs. DJ’s often have aluminium speaker poles. Flag Poles are often made from Aluminium Round Tube and lighting rigs in theatres, arena’s and nightclubs are usually made using Aluminium Tubes. Amateur radio enthusiasts often use long lengths of Aluminium Round Tube as a way of mounting their aerial at the correct height, and some of these radio hams even make their own aerials out of Aluminium Round Tubes and Aluminium Round Bars. Aluminium Tubes are commonly used in the automotive industry. For example, 7/8” od aluminium tube is often referred to by bike enthusiasts as Handlebar Tube, as this is the size most commonly used on motorbike handle bars. Intake pipes, coolant pipes, car air conditioning systems and spigots for brake cooling ducts for motor sport are other items that are commonly manufactured from Aluminium Round Tube. Aluminium Tubing is also used as pipework for compressed air systems, and finally we also supply Aluminium Tube to companies who use it to manufacture silencers for guns.